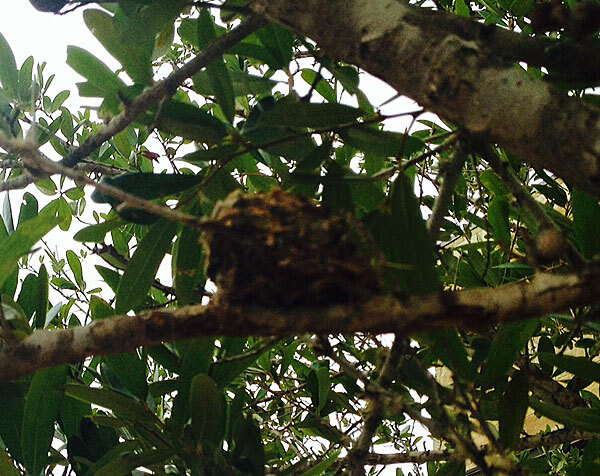 One of the guys at work claimed he'd seen a hummingbird nest in one of the trees outside our new office building. I was skeptical; in all our years of putting up feeders and watching the little guys, I'd never seen a hummer's nest. OK, so it's not the best photo in the world. The wind was gusting and it was threatening rain, and my phone had a hard time figuring out where to focus. But this is definitely a hummingbird's nest, no larger than two inches across. I figured it would be hidden better, but the tiny size means it's difficult to spot unless you're seriously searching for it. Here's the interesting thing about this. This is the THIRD brood of hatchlings this season in this nest! 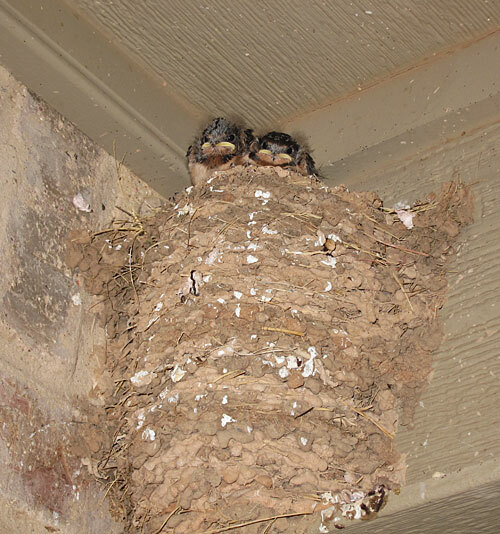 The swallows have been frisky little things this summer. And notice how the nest has grown taller; it's almost bumping up against the ceiling. I'm not sure whether I'll leave this nest up once they migrate for the winter. As I've mentioned before, it's in a fairly out-of-the-way location, and if I knock it down, they might pick a less convenient place to rebuild. But after two years, it's bound to be pretty gross, and maybe it's time to make them start over next spring. 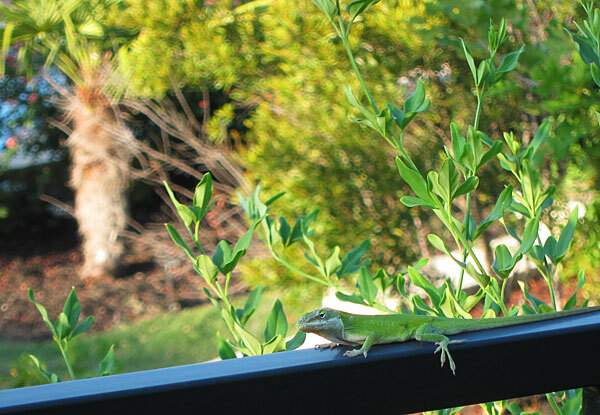 In closing, here's a picture of our Horseshoe Bay watch lizard, Poirot the Anole. This page contains a single entry by Eric published on September 5, 2014 8:38 PM. Camera Sunday was the previous entry in this blog. Driving Mr. Crazy is the next entry in this blog.